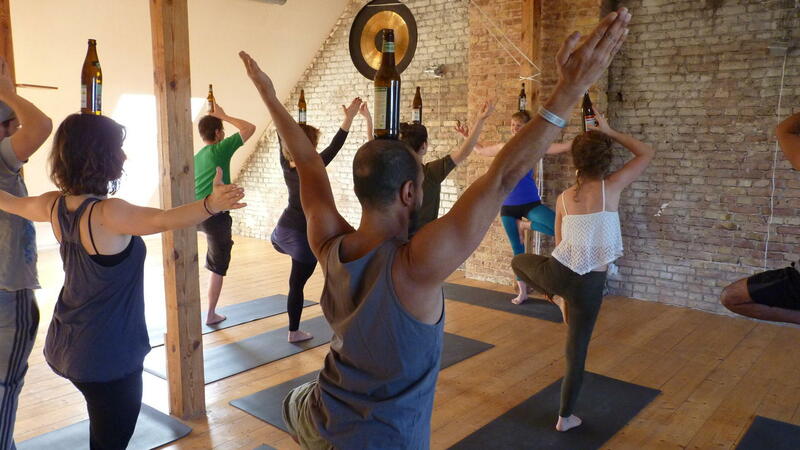 Time to raise a glass to beer yoga? First, there was Yoga, then ‘Bro-ga’, now get ready for ‘BierYoga’. This latest incarnation of yoga has already taken both Germany and Asia by storm and it’s heading your way. Some are even tipping combining traditional yoga poses with the art of gulping down bottles as the next international fitness craze. Just when it seemed as though every type of yoga spin-off had already happened, two beer-loving yoga teachers have pioneered a groundbreaking, yet strange, new yoga trend. BierYoga started in earnest over a year ago at a yoga studio in Berlin, Germany. The idea caught on quick as locals loved the idea of stretching during their drinking sessions. The classes were originally run by yoga teachers, Jhula and Emily, who first saw people drinking and practising yoga at a festival in Nevada. This slightly unbelievable fitness craze is quickly gaining followers internationally, even catching the attention of yoga-mad Australians. Classes are now taking place in Sydney, with students performing what are known as ‘beer salutations’ while balancing bottles on their heads. Surprisingly, it’s not the first time beer has been linked to sport and exercise. In February of 2014, we covered an article published in the International Journal of Sport Nutrition and Exercise Metabolism about the use of Beer as a sports drink? In it, researchers suggested that drinking low or non-alcoholic beer was actually a pretty reasonable way of rehydrating after exercise. So is BierYoga just another flash-in-the-pan fitness fad or is it a legitimate way to get people exercising? Only time will tell but don’t expect a book on it anytime soon.